We will learn how to find the slope-intercept form of a line. Let a line AB intersects the y-axis at Q and makes an angle θ with the positive direction of x-axis in anticlockwise sense and OQ = b. Let P (x, y) be any point on the line AB. 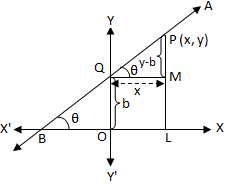 Draw PL perpendicular to x-axis and CM perpendicular on PL. Clearly, <PQM = θ, Since, QM parallel to x-axis. ⇒ y = mx + b, which is the required equation of the line and satisfied by the co-ordinates of all points on the line AB. 1. Find the equation of a straight line whose slope = -7 and which intersects the y-axis at a distance of 2 units from the origin. Here m = -7 and b = 2. Therefore, the equation of the straight line is y = mx + b ⇒ y = -7x + 2 ⇒ 7x + y – 2 = 0. 2. Find the slope and y-intercept of the straight-line 4x - 7y + 1 = 0.
m = 4/7 and b =1/7. Therefore, the slope of the given straight line is 4/7 and its y-intercept = 1/7 units. (i) The equation of a straight line of the form y = mx + b is called its slope-intercept from. (ii) If m and b are two fixed constants then equation of slope-intercept from y =mx + b represent a fixed line. (iii) If m is a fixed constant and b is an arbitrary constant then equation of slope-intercept from y =mx + b represent a family of parallel straight lines. (iv) If b is a fixed constant and m is an arbitrary constant then equation y = mx + b represent a family of straight lines passing through a fixed point. (v) If m and c both are arbitrary constants the equation y =mx + b represents a variable line. (vi) A line can cuts off an intercept b from the positive or negative y-axis then b is positive or negative respectively. (vii) If the line passes through the origin, then 0 = 0m + b ⇒ b = 0. Therefore, the equation of a line passing through the origin is y = mx, where m is the slope of the line. (viii) If the slope or gradient i.e., m = 0 and y-intercept i.e., b ≠ 0, then equation y = mx + b ⇒ y = 0x + b ⇒ y = b, which represents the equation of a line parallel to x-axis. So, when m = 0 then the slope-intercept form y = mx + b can be expressed as an equation of a straight line parallel to x-axis. (ix) When slope and y-intercept is zero (i.e., m = 0 and b = 0) then equation y =mx + b ⇒ y = 0x + 0 ⇒ y = 0, which represents the equation of x-axis. So, when m = 0 and b = 0 then the slope-intercept form y = mx + b can be expressed as an equation of x-axis. (x) When the angle of inclination θ = 90°, then slope m = tan 90° = undefined. In this case the line AB will be either parallel to y-axis or will coincide with the y-axis. So, the slope-intercept form y = mx + b cannot be expressed as an equation of y-axis or the equation of a line parallel to y-axis.